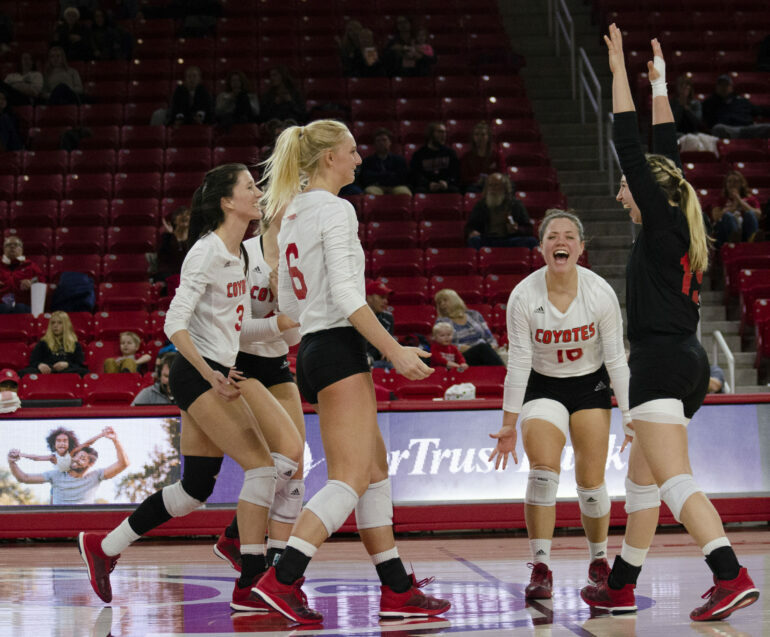 The Coyote volleyball team defeated North Dakota and North Dakota State in their final two games of the season. The Coyotes swept North Dakota (14-17, 6-9) in three sets, 25-23, 25-16, 25-20, at the Sanford Coyote Sports Center on Friday. Senior Taylor Wilson carried the Coyotes in kills with 18, two away from her season high, and a .467 hitting percentage. Senior hitter Hayley Dotseth recorded 11 kills, followed by junior Elizabeth Loschen with eight and freshman Claire Gerdes with seven. Junior Anne Rasmussen recorded 20 digs, and setter Madison Jurgens tallied 34 assists, making her the 12th Coyote of all time to reach 1,000 assists. USD defeated North Dakota State University (8-19, 6-10) in straight sets (25-18, 25-18, 25-17) on Senior Day at the SCSC on Sunday. USD ended the regular season sweeping eight of their last nine opponents. Dotseth led the Coyotes with 12 kills, nine digs, and six aces, one ace short of equaling the school record for a three-set match. Freshman Claire Gerdes added nine kills on a .462 hitting percentage. Madison Jurgens dished out 37 assists as well. Heading into the Summit League tournament this weekend, the Coyotes hold the No. 2 seed in the conference. Head coach Leanne Williamson said the team is taking it one game at a time. “I think today was really our focus, to try and take care of business at home. I think now we can really shift our focus into next weekend,” Williamson said. Despite the second-place seeding, Williamson and the team recognize the need for improvement before the tournament. The Coyotes finish the regular season with a record of 19-9 (13-3 Summit) and will earn a bye in the first round of the Summit League tournament in Denver. Their first game will be in the semifinals on Saturday, Nov 17.